Sierra recently released Geometry Wars 3: Dimensions, the high-energy retro arcade shooter from independent developer Lucid Games, for Android smartphones and tablets, as well as Amazon Fire tablets, which includes a single-player Adventure mode with 50 unique levels and a range of challenge modes, as well as five Classic modes inspired by past titles in the Geometry Wars™ franchise. This high paced game has overloading visuals and kinetic colors throughout. As with the Nintendo DS version, movement is the key to success as players can enjoy a retro title full of content and fun. The screen gets so full because of the shrapnel spreading from your shots. The circular solar flare-like combinations of enemies adds to the excitement. Other enemies include grunts, repulsors, mutators and Tetris-like flippers, but the names aren’t important, it’s each enemy’s abilities. Once you understand each enemy’s special abilities and spawning areas, your progression can rise as quickly as the challenges. First you need geom funds to upgrade your abilities, which can be found in every level. The trick is snatching these precious pieces without jeopardizing your life. Players must pursue these yellow shapes (triangle, diamond and small/big cross). You need multipliers as well – again look for the yellow icons left by the destroyed enemies. Your controls require some adjustment, so playing in the Retro Evolved mode first is highly recommended. This game mode has much more space allowing you time to understand the remote movement. There’s no help in the game or manual for the control scheme, so you must find the magic touch with the sensitive remote. At first it seems the scope is limited but turning your wrist and moving down a little bit, while keeping the remote steady, really helps. Once you get that red line moving where you want it (you can also change the aiming visual in preferences), it’s almost like riding a bike – you never forget. This involving title (originated from a mini game on the XBox title, Project Gotham Racing 2) features a standard medal system for each level. Unlike the Nintendo DS version, the action does NOT slow down a bit when the action gets thick, thanks to a higher powered console. Players can unlock bonus content with the Nintendo DS version. Just go to the connectivity menu to link to the correct console. Highly recommended for players of all ages. 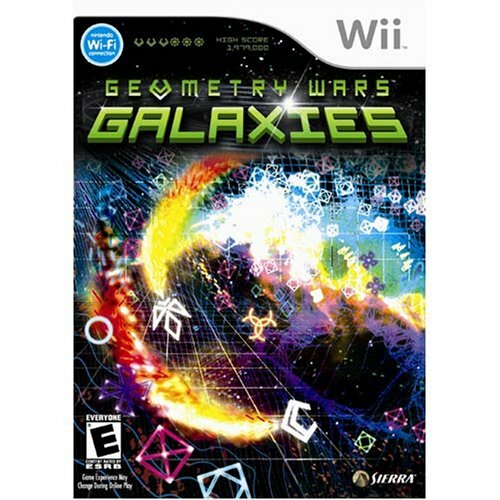 This entry was posted in Video Game Reviews and tagged Geometry Wars, Michael Siebenaler, Mike Siebenaler, Nintendo, Tall Writer, video games, Wii. Bookmark the permalink.